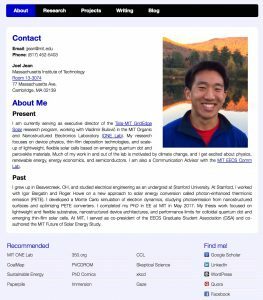 Why every Grad Student should have a website? One thing that baffles me is that only a few people going to pursue Master’s put serious efforts into building their own website. You are overlooking a lot of advantages if you do not yet have your website! You are knowledgeable – writing about a topic requires researching and fact finding. If you are writing informational posts, it shows you are an active reader and know about your field. You are confident – showing your work to the public requires having confidence in yourself. Whether righting informational posts or opinions, you project yourself as someone who is ready to take charge. You are intelligent – yep, if you write well, most people correlate it to a higher intelligence and IQ. Employers value your knowledge, creativity, and intelligence. A good weblog is a great way to show that. And more importantly, once you start writing, you will be forced to learn more so that you can write better. It is a very rewarding exercise. Now, the question is some people find writing to be a very daunting exercise. It is okay. As I said, you can gradually build upon it. But even if you are not actively blogging, you can still create a static website with your updated resume (even a creative version to grab your employer’s eye! ), list of projects with details, references and any interesting things you are up to. It can be your online diary and the good thing is half of it can come from your LinkedIn profile anyway. Secondly, your university is giving you free server space anyway, so why not create a quick page there? I like this simplistic website of Mr. Joel Jean who I hope won’t mind me using him as an example. He is focusing on the text and work rather than making it flashy. And if someone is really interested in peeking inside his mind, he has a separate link to the blog. Looks professional, to the point and seriously impressive!